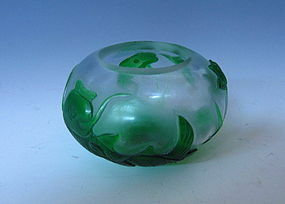 A sublime Peking glass water coupe with a carved motif of lotuses and a carp surrounding the object. The water coupe is often part of the group of objects found on a scholar's desk. Age: Republic (c1920). Size: diameter 3.25" height 2.3"
A Chinese qinhua or blue and white vase, beautifully painted, in the form often seen in archaic bronzes known as a gu, or a wine vessel. The vase is decorated with framed sections of views of landscapes and scholars near an embankment. The images are surrounded by cloud patterns with the character longevity done in the seal script. 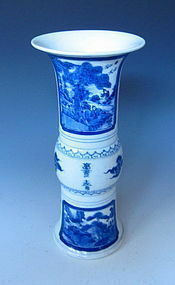 The vase has a Kangxi mark, but most likely republic period. Size: diameter 4.2 in. height 9 in. 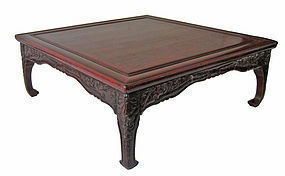 Antique Japanese red over black lacquer low table with negoro finish. It is decorated with incised scrolling leaves and floral design, scallop legs, circa 1910. It measures 35.5" wide 35.75" long 13.25" tall. 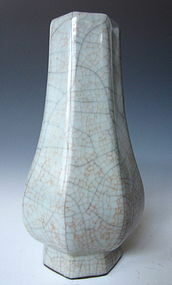 Antique Chinese pale cream glaze monochrome eight sided porcelain vase. The glaze suffused with a matrix of fine contrasting dark and fine lighter crackles, inside and out, including the base. Period: 18th century, Qing Dynasty. 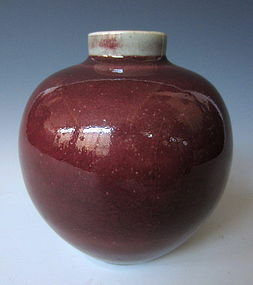 Size: Height 6.25"
Shapely antique Chinese monochrome porcelain small vase, ox-blood glaze. Period: 19th century, Qing Dynasty. 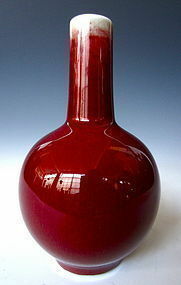 Size: Height 4.5"
Beautifully shaped antique Chinese monochrome porcelain vase, ox-blood glaze. White rim with ox-blood stripe. Imperial Guangxu mark (1875-1908) Size: Height 7.875"
Antique Chinese monochrome porcelain Langyao vase with dark pink peach bloom glaze with white rim. Period:19th century Size: Height 3.5"